Property Info: 5 Bedroom, 4.5 Bath resort home with approx. 3,200 sq. 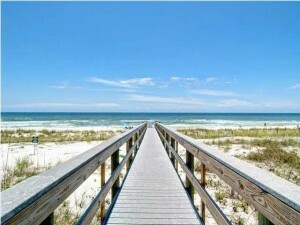 ft.
Parasol Place Beach House For Sale in Perdido Key FL. Parasol Place is a gated community situated on 900+ feet of beachfront and this home takes in all the gorgeous vistas that paradise exhibits. The pool and the Gulf Islands National Seashore are just steps away. Take a tour of this custom-built residence, with over 3,000 s.f. under roof, to see the quality of construction. This outstanding floor-plan is welcoming and excellent for entertaining family and friends. This resort home has a fireplace in the living room, new living room furniture, metal roof, hurricane shutters. new hurricane rated windows, and granite counter-tops throughout the large kitchen. The fully-equipped kitchen has a large island bar area and is complete with new stainless steel appliances. There is new tile flooring throughout the large master bedroom, the master bathroom includes split vanities, plus a walk-in closet. A balcony on the 3rd floor offers an incredible view of the Gulf of Mexico. Whether you want to enjoy the beach, explore Gulf Islands National Seashore, or just relax by the pool with a good book – this my be just what you’ve been looking for – come see this one!